We were discussing chores the other day. You see, after living in this house for two-ish years or so, I think I finally have a handle on how to clean the house the quickest, with the least amount of work. I know that things like that are terribly boring to some people, but I think that those people probably don't have sneaky children that are artistic, which is really code for: my kids color on stuff. Which, incidentally, does not help in the cleaning arena, because the children have colored on builder grade FLAT paint, which, as any mom will attest to, is of the devil. At any rate, we were talking about chores, and how we should divide things up. And dear, sweet Taylor offered to do the "most hardest job in the world." You see, this is the hardest job in the world, because FIRST, she would have to FIND THE BUTTERFLIES. And since I'm fairly certain that there are currently no butterflies living in the house, I can only assume that the finding of the butterflies would take a very long time. SECONDLY, when she DOES find a butterfly, she would have to catch it. Which would be highly amusing because she is rather short, and butterflies are rather tricky. I imagine that a lot of stacking and climbing would be involved. THEN she would have to catch the butterfly. Except that I was informed that she would need special purple butterfly "glubs" to catch it. Because butterflies only like purple. Not even pink. If you have pink gloves, the butterfly will BITE YOU with their TINY CHOMPY TEETH. 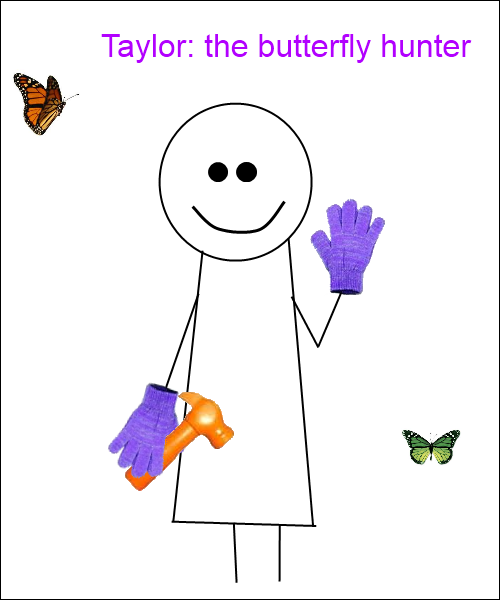 So, after putting on her special purple gloves, and climbing to the tippy top of whatever, then you have to sing a special butterfly catching song. It goes like this: "Butterfly! Fly Fly Fly! Butterfly! Me is your friend! Butterfly! I love you!" This song is EXTRA silly because you are REALLY tricking the butterfly. And when that butterfly is good and tricked, then it will land in the palms of your hands. And after you finish singing your sweet, sweet lullaby of death, you would squash it with a hammer. But not daddy's hammer, just a toy hammer, so that it would only hurt a little bit. Needless to say, the discussion about the divvying of the chores did not go as planned. But I do have an official butterfly killer now, and that has got to count for something.